Margareta Valdemarsdotter (1353-1412), Queen of Denmark, Norway and Sweden, was buried in Roskilde Cathedral. The memory of this powerful and revered sovereign is perpetuated there by the tomb-chest bearing her carved portrait. The golden gown which she according to one tradition wore at her wedding used also to be displayed there. When Denmark was ravaged by the Swedes in 1658, this costly relic was removed and, by order of King Charles X, deposited in Uppsala Cathedral. 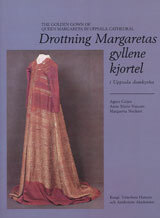 The golden gown was rediscovered by Agnes Branting who in 191 1 published an account of it in German, which made it internationally known as the only medieval gala dress still extant in Europe. It had long been obvious that Agnes Branting's description was in need of revision and also that an accurate restoration of the gown was required. The restoration took place in 1959/60 at the Textile Department of the Central Board of National Antiquities. The first edition of this book appeared in 1985. The second revised edition includes a radiocarbon dating of the gown showing that it dates from the first four decades of the 15th century. That means that the gown could have belonged to Queen Margareta, but it was not her wedding gown.